Waltner guitars are designed with the requirements of the concert musician in mind. Variability of sound, comfort of playing, projection and durability are all vital criteria that I follow in my guitar design and construction. All the experience and knowledge of guitarmaking that I have gathered over the years is united in the 'Concert'. Dealing intensively with the sound characteristics of old Spanish guitars while at the same time inspired by the German guitar making tradition and a patent Hermann Hauser I obtained in 1921, this guitar has a top construction that combines both Spanish and German traditions. The 'Essence' has all the qualities of the 'Concert' combined with the application of rare and exclusive woods and particularly high-quality varnish and technology. 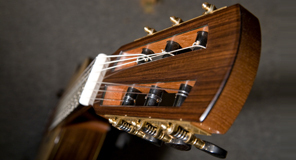 A modest, hand-carved, profiled headstock adds a touch of exclusivity to the instrument.